Dear music-lovers, dear friends of Bläserurlaub! It’s that time of the year again! 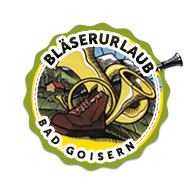 This year we are organizing the 22th “Bläserurlaub Bad Goisern”, an intensive course combined with a holiday full of adventure in a relaxed atmosphere - for all woodwind, brass and percussion instrumentalists, ensemble leaders and band masters - of all ages and all levels – and situated in the middle of the beautiful Salzkammergut region. As in the past our teachers are renowned musicians, many of them solo players in orchestras or professors at universities or academies of music. The ideal group size is up to 9 people per teacher, if there are more participants then we shall organize further teachers. Our course is directed towards those attending schools of music, hobby musicians, young musicians, music teachers and music students. Last year's participants were between the ages of 7 and 87 – beginners, music scholars and those playing in bands (all of varying ages), students and music teachers also take part. Thanks to the way the tuition is organized we are able to offer each participant solo, group and ensemble tuition at the level he/she is at. As we find it important we are also offering further subsidiary subjects in breathing, rhythm, posture, conducting, autogenic training, music psychology, making reeds, dance music, woodwind chamber music, brass chamber music, Big Band and piano for non-pianists. Furthermore, sheet music and instruments will be on display. There are also numerous opportunities to perform: “Long night of the soloists”, church concerts, the open air concert and at “Jam sessions”. In order to make the course more appealing for families, ensembles and bands we are offering various family and group reductions (it is necessary to register at the same time!). We have also organized reasonable accommodation and lunch/dinner. Joint activities such as all of the concerts, the course party, hikes, concerts in the Ice Caves and at Lake Halstatt are an important part of the course. Accompanying family members are also welcome to take part. If you still have any questions please don't hesitate to contact us. Why don't you come and see what we have to offer! or via email to natascha.brugger@gmx.at. Food and accommodation are not included in the course fee. However, there are two guest houses which are providing set menus for our participants (approximately €8.00).